Punctuated Equilibrium and Its Relevance to Investment Markets - Epoch Investment Partners, Inc.
Before I begin, I’d like to thank the Institute for Private Investors for inviting me to speak with you today. The topic of this forum – “Sustainability and Disequilibrium” – is a topic that interests me not only as a money manager, but also as a citizen of our increasingly global community. Sustainability and disequilibrium are both rooted in change. Much of my career has been built around the identification and management of change. And, today, as our world faces challenges both at home and abroad, change will be the defining characteristic of our investment landscape. This talk is designed to approach the notions of sustainability and disequilibrium from a multi-disciplinary standpoint. In order to gain fresh insights into the dynamics of investing, it is often helpful to consider how ideas from diverse schools of thought can help us see the capital markets in a new and compelling light. In that spirit, I would like to discuss the concept of “punctuated equilibrium” and the manner in which this theory of evolutionary biology can be applied to today’s financial landscape. The theory of punctuated equilibrium was developed by Stephen Jay Gould, the highly regarded Professor of Paleontology, Biology and Natural History at Harvard University. Punctuated equilibrium describes a new understanding of Darwinian evolutionism in which species evolve not through slow, gradual genetic modifications but, rather, through intermittent periods of sudden and rapid change. Gould asserted that, when evolution does occur, it happens sporadically and occurs relatively quickly compared to a species’ full duration on earth. I believe that the theory of punctuated equilibrium is remarkably applicable to the world of investing. Sudden equilibrium shifts do not only occur within fossil records: they occur within security markets as well. Such shifts occur because of changes in the drivers of real economic growth such as inflation, interest rates, productivity and profits as well as the development of new financial products such as derivatives and their related myriad of applications. In our discussion this morning, we will examine how the investment landscape has already been suddenly and dramatically altered by changes to these variables, and we will show why the immediate future may follow a similar path. Globalization altered the investment landscape in a manner that was both immediate and comprehensive. With the fall of the Berlin Wall in 1989, economic borders – both physical and theoretical – were eliminated and the creation of the global economy was instantly accelerated. Suddenly, the world’s labor pool began to double, resulting in the addition of nearly three billion workers to the global marketplace. While these new laborers offered the willingness and ability to work, they did not bring any additional capital with them. This picture can best be gleaned by looking at two maps of the world. The first figure reflects how the world would work if each country were the size of its GNP. The second map (Figure 2) indicates what the world would look like if each country size reflected its population. Thus began the biggest wage arbitrage in history. Returns to capital escalated dramatically while wage gains stagnated in the developed nations and jobs grew sharply in the undeveloped world. The net effect of all these sudden and widespread changes was better-than-expected growth, a sharp improvement in labor productivity and a surge in profits, causing corporate profits as a percentage of GDP for the G-7 countries to reach record highs. There are two reasons I’ve started this talk with a brief review of globalization. First, globalization is this era’s most important instance of punctuated equilibrium to date, and is therefore useful as a real-life case study. Second, in addition to quickly and thoroughly altering today’s investment landscape, globalization may have also sown the seeds for the next big “punctuation” of tomorrow. Specifically, we believe this punctuation could take the form of a global liquidity crisis in which the investment community as a whole will be forced to reevaluate their relationship to risk. The rapid growth of securitization will trigger this phenomenon. The rest of this paper will explore the various ways in which this upcoming liquidity- and securitization-based punctuation could manifest itself in the capital markets. Over the past twenty years, securitization has occurred with incredible speed and magnitude. The volume of publicly traded fixed income and equity securities has risen dramatically from the level in 1980, as shown in Figure 4. In relation to world GDP this is an increase 3 times the rate of growth of nominal GDP. Whereas the market value of bank deposits, as nominal GDP securities and equities were approximately the same in 1980, today that number is over three times the GDP level of $45 trillion for the world as a whole in 2005. And this is without taking into account the phenomenal growth of the nominal value of derivatives which now exceed $415 trillion according to the Bank of International Settlements or 9 times the world’s GDP of $46.6 trillion in 2006. At the heart of securitization is the separation of the origination of the security from the ownership of the security. This is easily seen in the mortgage industry and is particularly observable with recent events in the sub-prime mortgage field. Since the originator of the sub-prime mortgage knows he is unlikely to hold the security for more than a few days, due diligence becomes lax with respect to evaluating the qualifications of the borrower. The originator quickly sells the security to a mortgage pool owner and the securitized mortgage is then commingled with other similar financial instruments. While this process may seem somewhat innocuous on the surface, there are real dangers to securitization. When assets are securitized – as in our sub-prime mortgage example – “specific risk” is reduced. That is, the risk to the individual originator or owner of the security is lessened. However, the securitization process also dramatically increases “systematic” risk: the financial risk to the system as a whole. Again, this risk is exacerbated by the result of the due diligence missteps that can arise when the roles of originator and owner are no longer one and the same. A must read paper on this subject “ How Resilient are Mortgage Backed Securities to Collateralized Debt Obligation Market Disruptions”, has been authored by Joseph R. Mason and Joshua Rosner and is available through www.hudson.org. We have also written a paper on the subject entitled, “The Canary in the Coal Mine: Sub-Prime Mortgages, Mortgage- Backed Securities, and the US Housing Bust” by John Reddan and William Priest. In short, securitization is a huge force in finance. It has provided liquidity where it did not exist previously. But securitization has also created the imbalances within our global economy and, in so doing, has ushered our marketplace to the position of another punctuated equilibrium. To fully understand why our investment landscape could be headed toward a securitization-driven instance of punctuated equilibrium, it is first necessary to determine the roots of our current liquidity dilemma. To begin, let’s review the relationship between the real economy and the financial economy. Figure 5 presents a schematic for showing how what happens in the real economy drives the financial economy. To illustrate how the model works, let’s plug in some numbers. Over very long periods of time, real GDP growth has averaged around 3%: a number that has recently been influenced by the effects of globalization. Coincidentally, inflation has averaged around 3% as well, albeit with much wider period-to-period swings (from negative numbers to positive double digits). Therefore, if we combine real GDP growth with inflation, we find that nominal GDP has grown around 6% over much of economic history. Interestingly, growth in corporate profits has mirrored nominal GDP growth over time, as shown in Figure 6. In addition, the P/E ratio – the valuation metric most closely associated with this model of the real and financial economies – has fluctuated with interest rates and inflation in an inverse fashion (see Figure 7). Let’s fast forward this model to the present. In recent years, much of the activity in the real and financial economies has been driven by concerns over the “inflation” aspect of the equation. Specifically, the world’s monetary authorities (led by our Fed) feared deflation as the aftermath of the equity bubble implosion in 2000. As a result, interest rates were lowered in order to encourage investors to invest. As a result of these low interest rates, investors became far less risk averse than in earlier days. In fact, the riskier the investment, the better. Investors began an aggressive international hunt for yield, inflating asset prices and exacerbating the global financial imbalance. In addition, the low rates maintained by the central banks created one of the world’s great “carry trades”, in which investors could borrow short and lend long in order to capture the spread in interest rates and duration. The popularity of these carry trades formed a bubble that migrated from equities in 2000 to housing in subsequent years. Over the past year, however, the central banks have suddenly changed their tune. Just as they had once loosened their monetary policies in tandem, they are now engaged in joint tightening. There is no financial variable more powerful than interest rates, and our Fed has raised short term rates 17 times in the past few years. To understand the effects of this profound transition in monetary policy, one need only compare the current interest rate curve with that of two years ago (see Figure 8). The upward shift and overall flattening of today’s interest rate curve has put pressure on the carry trade in the U.S. and has reduced the present value of investments made as recently as two years ago, most noticeably in housing finance paper. The world’s central bankers have raised the cost of capital and the resulting effects are rippling through the financial markets. Record compressed spreads in the bond market will eventually widen, and the risk reduction trade will be on in earnest when that happens. In our view, this is a strong indication that we may be witnessing the early stages of a transition to another equilibrium. So how will this next instance of punctuated equilibrium manifest itself? We believe it will take the form of the bursting of the liquidity bubble: an event that may be caused, in large part, by global financial imbalances and the dangers of hedge fund behavior. In our view, this phenomenon will occur hand-in-hand with rising interest rates and a growing risk-aversion on the part of investors and consumers. Let’s take a look at how and why this might progress. Before the recent contraction of worldwide monetary policy, low interest rates had caused investors to seek out riskier investments. Now that the central banks have agreed to raise the cost of capital, investors have started to reevaluate their appetite for risk. In the words of the European Central Bank’s Financial Stability Review of June 2006: “…the main source of vulnerability in the period ahead continues to centre upon concern that a global search for yield, which began in 2003, may have led investors…either to underestimate or to take on too much risk.” And when people lose their appetite for risk, they often lose their appetite for consumption, which has immediate and meaningful effects on liquidity. This brings us to what is, in our opinion, one of the most worrisome indications that we are headed for an economic “punctuation.” The international markets currently suffer from what the Financial Stability Review deems “global financial imbalances,” in which the economic relationships between countries and marketplaces have become increasingly unsustainable, a topic on which Morgan Stanley’s Steve Roach has often opined. One of the primary causes of this unsustainability is the fact that the world’s most powerful engine of consumption (i.e. the U.S. consumer) appears ready to stall. Before we take a closer look at the evidence behind this slowdown in U.S. consumption, let’s first discuss how and why these “global financial imbalances” occurred in the first place. Many of these imbalances are rooted in the U.S. and represent significant vulnerability for global financial system stability. First, American households have been dis-saving in record numbers, which has resulted in growing funding pressures on global capital markets. Furthermore, U.S. imports have reached twice the size of exports, causing the current account deficit to grow to a record-breaking 6% of U.S. GDP. In addition, the foreign holdings of U.S. Treasuries have more than doubled over the past 10 years. Today, over 50% of U.S. treasury securities are held by foreign owners, as shown in Figure 9. Based on these facts, it is not hard to imagine how these global financial imbalances could unwind. If the U.S. becomes unable to finance its deficits, it could result in “an abrupt asset portfolio reallocation, either by the official or the private sector, or…a sudden deterioration in the risk appetite of global investors for accumulating U.S. securities in sufficiently large amounts,” so states the ECB writing of last June. We are the reserve currency of the world; we can print dollars when all others must earn them. But, given our twin deficits and the severe imbalances in the international marketplace, how much longer can we expect international investors to remain confident in lending their money to the U.S.? In other words, if you owned our paper, how confident would you be that the U.S. would honor its debt obligations at the same level of purchasing power at which these debts were incurred. Why would the U.S. not allow inflation and the resulting decline of the currency to resolve its debt obligations? Simply put: why trust us? If other nations do, in fact, stop trusting the economic hegemony of the U.S., it could “entail sudden and destabilizing changes in global capital flow patterns.” These sudden and destabilizing changes would include downward pressure on the U.S. dollar, further increases in interest rates, and, of course, the bursting of the liquidity bubble. And, because of the “increasingly global nature of the asset allocation process,” these events would necessarily affect every aspect of the investment landscape. In our view, if this series of events comes to pass, a punctuation is nearly unavoidable. In fact, there is existing data that supports the theory that this punctuation is already underway. We discussed how a slowdown in the spending patterns of the U.S. consumer could be the tripping wire for the scenario under consideration. The characteristics of today’s marketplace indicate that such a slowdown could be on the horizon. First of all, median incomes have risen by only 1% since 2000, and energy prices, whether in the form of gasoline or heating oil, have increased sharply. The deflation of the housing market will cause millions of Americans to reevaluate their spending habits. Rising interest rates have closed the “home ATM machine” that had financed our country’s penchant for excess consumption and, later this year, a huge volume of adjustable rate mortgages will require re-sets. All things considered, the outlook for discretionary spending cannot be good. Because U.S. consumer spending is equal to 20% of world GDP, any modifications to our historical levels of consumption will necessarily impact every aspect of the international marketplace. So, if this consumer spending slowdown indeed proves to be the case, what does it mean for the “feeder nations” that have benefited from the U.S. consumer? The answer is that these countries lack middle class populations large enough to generate sufficient internal demand. Put another way, when the U.S. stops buying, they will stop selling, creating a massive shift in the worldwide supply/demand paradigm. And, as discussed earlier, this could cause global financial imbalances to resolve themselves in a manner that destroys liquidity and creates the market’s next big evolutionary event. The imbalanced nature of the world’s markets is only one of the drivers behind the upcoming liquidity-based equilibrium punctuation. There is also the disturbing presence of large, concentrated pools of capital in the world’s markets that aggravate market volatility levels. Here, we’re referring specifically to hedge funds. Today, between 30% and 50% of the volume on the NYSE is from hedge funds. The popularity of these funds was driven in part by the low interest rate environment of prior years, in which investors sought out hedge funds in their search for yield. As a product of the former liquidity bubble, we believe that these funds possess certain characteristics that may bode ill for the future of the investment landscape. First of all, many of these funds have shown a troubling aversion to transparency standards. Even when the SEC sought minimum registration from these funds, many of them were able to avoid regulation in the form of extended lock-ups and other SEC disclosure conditions. On top of this, the Fed Chairman appears to hold the misguided opinion that self regulation and market discipline is sufficient to keep hedge funds under control. Taken together, the magnitude of capital controlled by hedge funds, their inconsistent application of best practice standards, and the “blind-eye” policy of today’s Federal Reserve sets the stage for yet another potential contribution to a punctuation within our economic equilibrium. All in all, the findings provide some support for the view that the hedge fund industry has benefited from the recent global search for yield, as aggregate net flows appear to be sensitive to investor risk appetite and to the level of short term interest rates. This also raises the risk that hedge fund managers may have underestimated investor redemption risk arising from global financial conditions that is not so apparent at the level of individual hedge funds. An unexpected end of the recent global search for yield could cause investors to withdraw their money abruptly, thereby exerting funding liquidity pressures on individual hedge funds. This could trigger substantial share sell-offs and challenge perceptions regarding the degree of liquidity prevailing in affected markets. All things considered, we believe that hedge fund activity is poised to play a role in the capital market’s next instance of punctuated equilibrium. Over the past several years, investors have been on an aggressive hunt for yield, which has led to increased hedge fund inflows. Now, however, it is clear that this same trend may have increased the market’s vulnerability to risk reappraisal and abrupt asset price adjustments. In other words: “For financial markets, large and potentially correlated asset price adjustments could cause liquidity to dry up and undermine the hedging of financial risks.” This means that hedge funds may cause the market equilibrium to be punctured sooner and more severely than many investors had anticipated. An excellent read on this subject is Richard Bookstaber’s new book, A Demon of Our Own Design, which discusses the unintended consequences of the rapid growth of derivative products. In conclusion, I’d like to return to the scientific underpinnings of the theory around which this talk was designed. “Punctuated Equilibrium” is a complex idea. Not only does it purport to explain how plants and animals have adapted to the challenges of life on earth, it has also recently been used to enrich our understanding of social theory and policy studies. 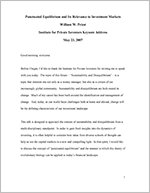 In 1993, Frank Baumgartner and Bryan Jones asserted that, within human societies, policies undergo long periods of stability, punctuated by large, but rare, changes due to momentous shifts in society or government. Today, I would like to put forth the suggestion that the same can be said of financial marketplaces and economic structures. In this talk, we have covered a wide range of topics – from globalization to securitization to the global liquidity bubble to hedge funds – and it is my belief that each of these elements plays a key role in the investor’s version of punctuated equilibrium. As the global liquidity bubble nears a bursting-point, the ideas offered to us by evolutionary biology and social theory can help us frame the situation in a way that will help us preserve capital and manage risk. As stated earlier, it’s all about change. The extent to which we can adapt to change – by embracing both sustainability and disequilibrium – is dependent on the insight and flexibility with which we view our global investment landscape. We are on the brink of exciting and noteworthy times. To paraphrase Darwin, the coming years will indeed result in the survival of the fittest. And, if we arm ourselves with the lessons of punctuated equilibrium, we can ensure our place among the survivors.